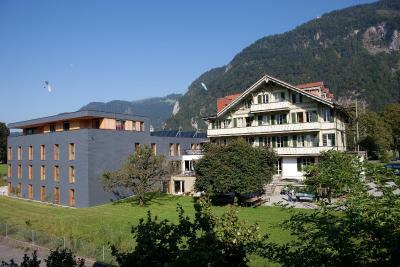 Lock in a great price for Backpackers Villa Sonnenhof - Hostel Interlaken – rated 9 by recent guests! eating outside is very expensive. It is money-saving and convenient to cook by yourself. You can get the ingredient at Coop. Good! Backpacker villa is just awesome, very detail oriented and considerate. 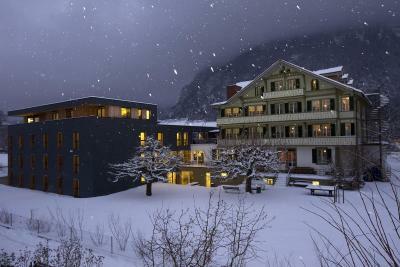 It helps you navigate your trip and make your trip more convenient overall: free locker after checkout, half price for harder crum, free entrance to swimming pool, ticket purchase for Jungfrau, free bus in the town. Really enjoyed my stay! The breakfast is decent. I love that the hostel provides free tokens for you to exchange two free coffee or for free laundry. Easy to find when you arrive the platform. You can even walk from the station without taking bus. The staff were great and helpful. I like that the room was relatively comfortable except for the pillow which was flat as a blanket and offer no real neck support. The Staff are great. They are really helpful. The property was easy to walk to or access from bus. 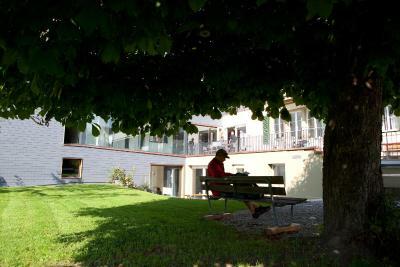 The family-friendly Backpackers Villa in Interlaken, in the heart of the Bernese Oberland, offers simple yet stylish rooms that are individually decorated. 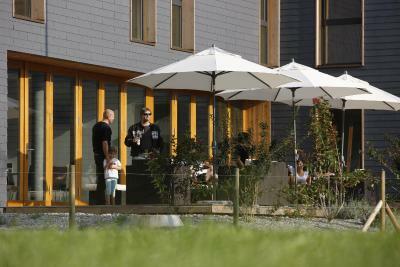 Free WiFi is available in all areas of the property. Every guest has free access to the self-catering kitchen facilities. Guests enjoy free access to the public indoor and outdoor swimming pools, free mini golf, free use of public buses, and free parking. Linen, duvets and a small towel are included in the rate. Beds (complete with a sheet and cover) are made for you already on arrival. 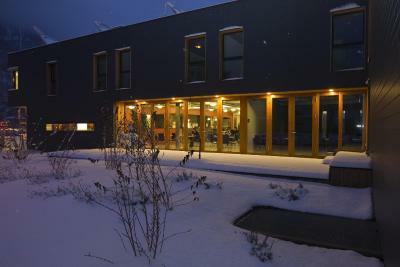 The reception is open daily from 07:00 until 23:00, and multilingual staff are always ready to help. 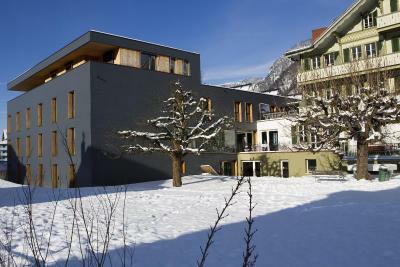 뀐 Located in the real heart of Interlaken, this property has an excellent location score of 8.5! 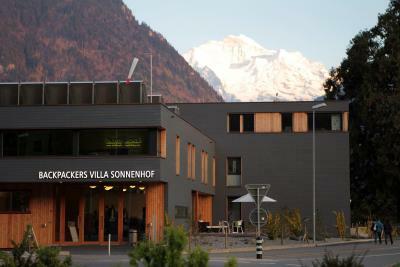 When would you like to stay at Backpackers Villa Sonnenhof - Hostel Interlaken? Individually decorated rooms with free Wi-Fi. Towels are provided for free. No extra beds, only 1 baby cot for children up to 2 years are available in this room type. Individually decorated room with attached bathroom with 1 single bed and a bunk bed. Towels are provided for free. Individually decorated room with 5 beds (bunk beds) and an private bathroom. Towels are provided for free. Individually decorated and simply furnished rooms with a washbasin in a separate older building. Free Wi-Fi is available. The bathroom and toilet are on the hall. Bed linen and towels are provided in the rooms. Single bed in a dormitory room, consisting of a washbasin. Shared bathroom facilities can be found on the hall. Towels are provided for free. Please note that children under the age of 16 cannot be accommodated in dormitory rooms. Individually decorated room with attached bathroom. Towels are provided for free. Single bed in a female only dormitory room with 7 beds. The shared showers are located in the hallway. Towels are provided for free. Backpackers Villa provides budget accommodation in 4 - 6 bed rooms. It's perfect for individual travellers, small groups and easy-going families. You receive the sheets and linens at reception and put them on yourselves as well as take them off at the end of your stay and return them to reception. There is a kitchen available to all guests with several cooking stoves and washing up basins. This is one kitchen for everyone. We offer free Wifi in the whole building including the rooms. Also, breakfast is included and served from 7am to 10.30am. We do not serve any other meals. One can use the kitchen to cook or go out. There are many good restaurants in easy walking distance. The rooms at Backpackers Villa have 4 to 6 beds in one room. There is no TV, fridge or telephone in the rooms. But, there is a TV room for everyone, several fridges in the guest kitchen and public phones on the floors. We are proud of our very knowledgeable local staff who are happy to help you with planning your outings, booking train / cable car tickets to Jungfrau or Schilthorn and we are also your adventure sports booking desk. 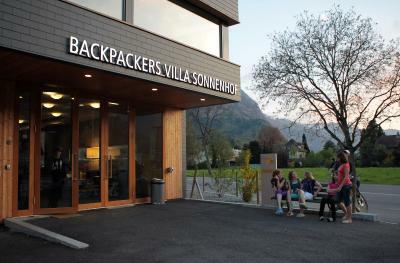 House Rules Backpackers Villa Sonnenhof - Hostel Interlaken takes special requests – add in the next step! If you arrive later than 23:00 you will find the keys in the blue key box at the night entrance. Just enter the last 5 digits of your booking number at the key box. Please note that children cannot sleep in the same bed as their parents. An extra bed needs to be booked. Please also note that children under the age of 16 cannot be accommodated in dormitory rooms. Six people in a room, wondeful location and nice kitchen. The staffs here are helpful and kind to offer travelling suggestions. They would offer tokens for drinks and wash machine. This is best hostel I have ever lived. Nothing much, everything was perfect. Friendly staff at front desk, very informative and helpful during the check in and through out the stay. Good location and great facility. Beautiful view from balcony. Kitchen was perfect, shower was good, bed was super comfy, locker was perfect on its size, room was clean and free towel. Plus, free city public transport card.... Two coins for Coffee or Laundry. It doesn't end here... You will get free breakfast too! 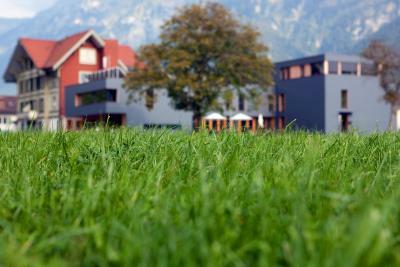 What a perfect stay I had in Interlaken, thank you so much guys. I will be back soon. The staff very friendly and helpful, comfy place, great location! it was a little bit awkward how the beds was placed. they are too close to each other.... but the bed is comfortable and well designed. 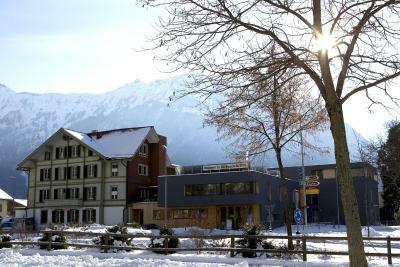 great location (Interlaken is not big though) ten to fifteen minutes to both ost and west station. five minutes walk to restaurant area. Helpful staff, explained information very detailedly. Free storage services. Breakfast is nice, free three (or four) hot drinks.Free washer tokens. Would choose again if going to Interlaken again. 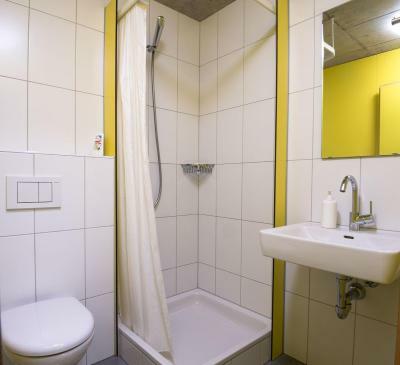 This isn't a knock on the hostel itself, you know Switzerland is expensive overall compared to most other parts of Europe, so you just need to be prepared for that stark realization heading in. Basing yourself in Interlaken and traveling back and forth to the Grindelwald/Lauterbrunnen region can be a quickly expensive proposition if you haven't researched in advance. The Eurail rail pass only gives you a limited discount on the trains heading into the Jungfrau. I didn't suffer from this issue going when visiting since I live in Europe, but just a heads-up when when visiting one of the most beautiful regions of Europe. You might have to lean on a Swiss Travel Pass or Swiss Half-Fare Card to control costs in the non-winter season. I came in late to Interlaken, like 1 AM levels of late. True to their policy, I input the code and got my room key to access the hostel. A towel and welcome paper laid inside before I headed upstairs. 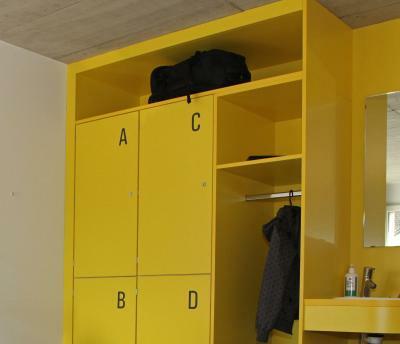 Bedding and bathroom accommodations are of top quality when compared to other hostels. 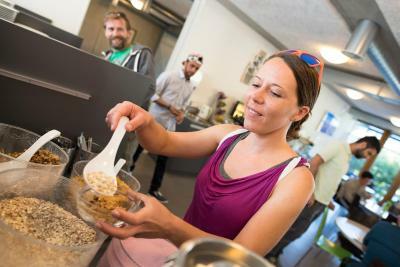 They had a nice breakfast, pretty standard fare for a hostel, no complaints there. They had a kitchen and other services offered, but I never used them, but I'm sure others will find it useful when eating out in the country is really expensive and you start counting one's money. The staff were really helpful for arranging me a ski pass to snowboard in Jungfrau ski area, and it is so worth it. They can arrange for many activities in the region, so just go ask. 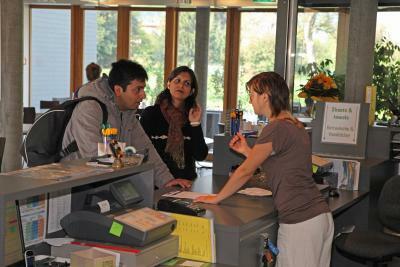 You get a visitor's card to take local buses around to explore Interlaken. This isn't a party hostel, so it gets quiet at night, you can always walk to nearby bars and clubs to fulfill one's nightlife needs, just don't forget to have your key on hand so you can get back in after 11 PM. The fact that the hostel is not located where it supposed to be according to pictures. I feel like deceived to be honest. The breakfast is also very poor for my taste. But hey maybe I am too old. Comfortable place to cook and equipped with washing machine. Kind staff. Always clean room. Great staff, excellent location and good for recommendations. Couldn’t fault them.